The Dremel 3000-1/25 Variable-Speed Rotary Tool Kit is the result of an upgrade implementing user-requested features to improve the tool's design and ergonomics. The tool also features the EZ Twist nose cap with an integrated wrench that allows the nose cap to be used as a wrench to tighten accessories and eliminates the need for a separate wrench. A more efficient fan design and side vents provide a cooler running tool making it comfortable for extended periods of use. The tool also features a symmetrical design including a trumpet-shaped nose cap to facilitate a pencil-grip tool hold. 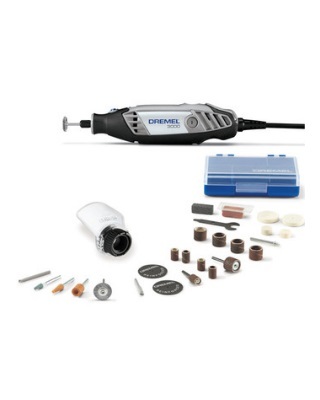 The Dremel 3000-1/25 kit comes with an attachment and 25 accessories to be able to cut, grind, sand, carve, and polish a variety of materials.